Advanced maternal age at the time of giving birth is known to decrease how long the offspring will live and their fecundity. However, why this occurs is unknown, and it remains unclear if maternal age also alters how offspring respond to interventions to aging. Researchers at the Marine Biological Laboratory (MBL) are working on answers. In a study published in Scientific Reports, they demonstrate that maternal age affects how well offspring respond to dietary interventions that are known to increase lifespan. "There has been evidence for well over a century, from experiments done in a wide variety of animal species and from data in humans, that offspring from older mothers have shorter lifespans and lower [rates of] reproduction," says MBL scientist Kristin Gribble. "But it wasn't well understood how a mother's age might affect other aspects of her offspring's health or response to interventions." Using rotifers (microscopic, water-dwelling animals), Gribble and her team studied the effects of maternal age on offspring aging and their response to dietary changes. In their experiments, they fed mother rotifers a regular diet. They then studied the offspring from young (about three days old), middle-aged, and advanced-aged (about nine days old) mothers. The offspring were fed one of three different diets: constant high food, constant low food, or alternating between high food and fasting every other day. 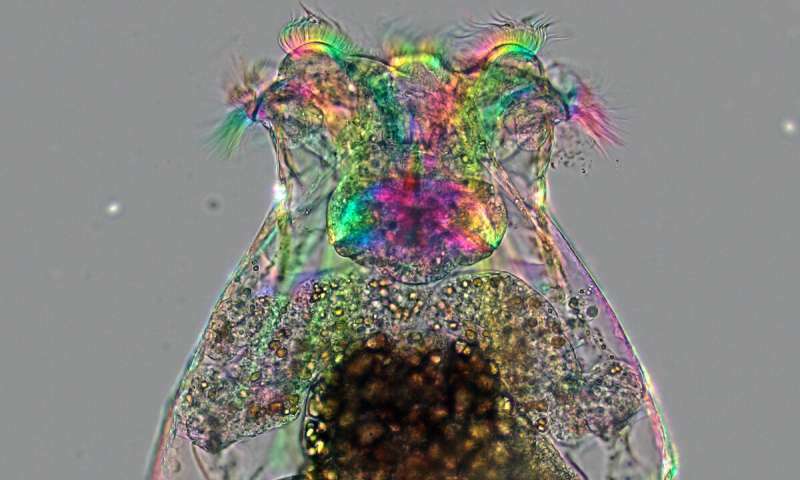 "These calorie-restricted and intermittent-fasting diets are known to significantly increase lifespan in rotifers and many other species," says Gribble. "Our study confirmed that offspring from older mothers have shorter lifespans and lower reproductive rates than offspring of younger mothers," Gribble says. "However, offspring of older mothers, we found, have a greater increase in lifespan in response to caloric restriction than do young-mother offspring." In the offspring born from older mothers, the decreased lifespan seemed to be due to an earlier onset of aging. This early onset was delayed when those offspring were subject to caloric restriction. Even though offspring from older mothers responded more positively to caloric restriction, it did not improve their overall fitness. In evolutionary terms, "fitness" takes into consideration both lifespan and rates of reproduction. For old-mother offspring on caloric restriction or full food diets, the window for reproduction was shortened and they had half as many offspring—only 14-15, instead of the average of 25 to 30 for young-mother offspring. Caloric restriction did not rescue reproduction. "It is an important finding that a mother's age can affect not only her offspring's lifespan and reproduction, but also other aspects of her offspring's health, body size, and responses to environmental conditions," says Gribble. "This could have implications for how drugs, diet, exercise, or other interventions might differently affect children from young mothers and from older mothers." In their next steps, Gribble and her lab will probe the molecular mechanisms controlling maternal age effects in rotifers. Given that rotifers and humans share many genes, they think their findings may have implications for human health, and may be used to develop therapies to treat human aging. "Rotifers are quite different than people, of course. But there are already many studies in humans that suggest that advanced maternal age negatively impacts children's lifespans, and increases the chance for neurodegenerative and other diseases," says Gribble. "I think it is likely that maternal age may also determine the response to environmental conditions, lifestyle, and medical treatments in people. A lot more work will need to be done to determine if our findings hold in people and if they are caused by similar molecular mechanisms."